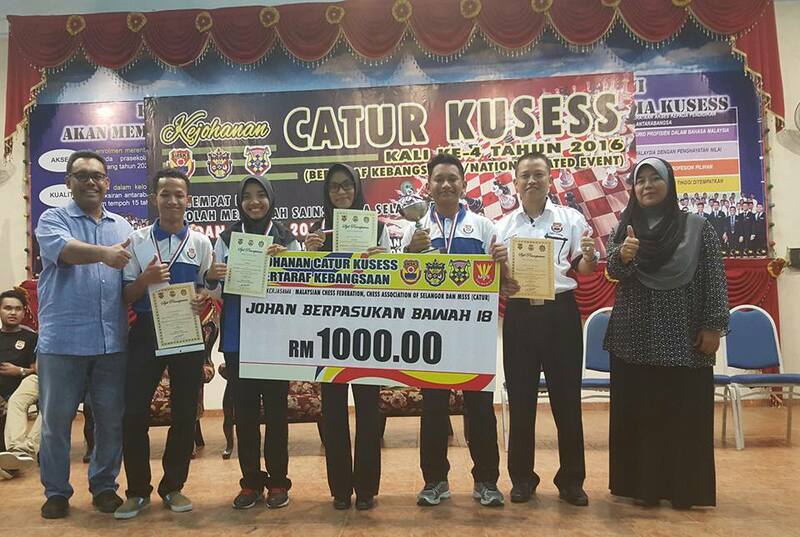 SJKC (P) Pulau Pinang team emerges champion in the Pimary School category of the fourth KUSESS Chess Open 2016. The team event of the championship was participated in by 30 school teams. 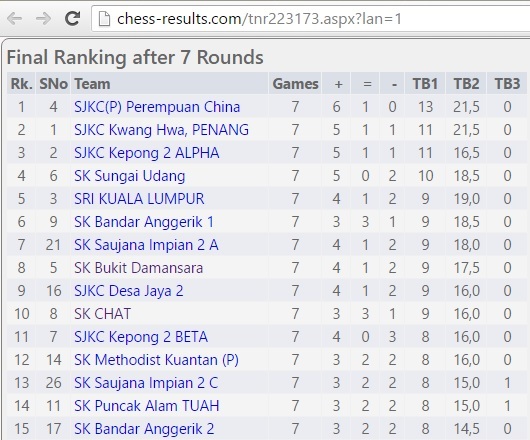 The team which is the fourth seed comprises of Sim Jia Ru on Board 1, Lim Joe Shawn on Board 2, Alden Goh Kai Ray on Board 3 and Ryan Lee on Board 4. 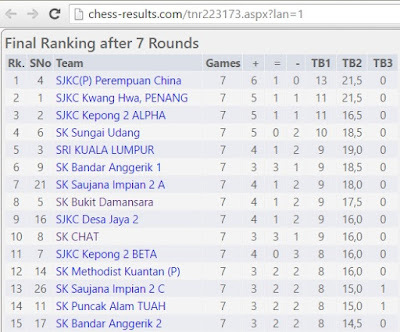 The team had won six rounds and drew one accumulating 13 match points. 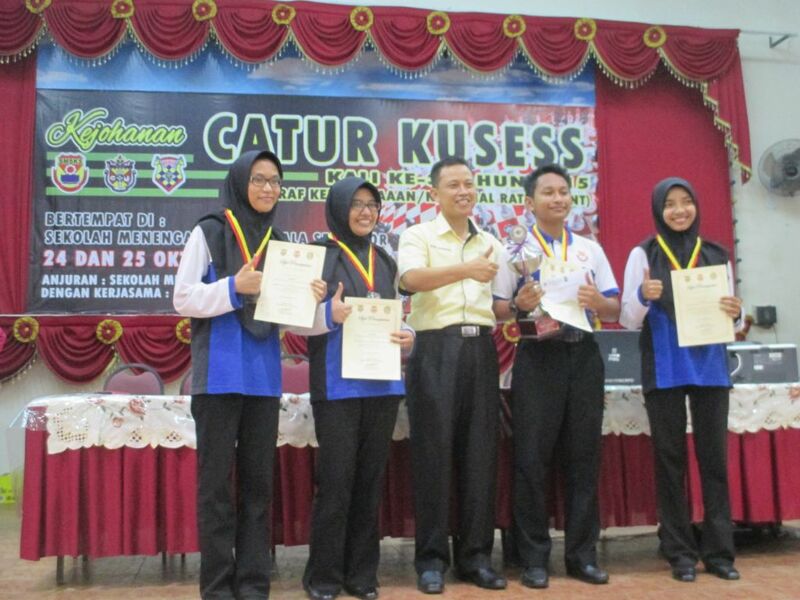 Well Done, SJKC (P) Pulau Pinang! CONGRATULATION! 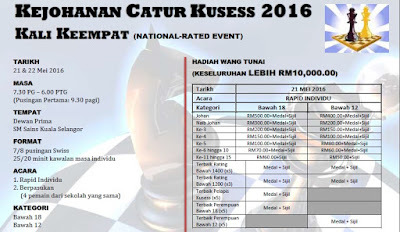 One of the events in the two-day KUSESS Chess Open 2016 is the Team event. 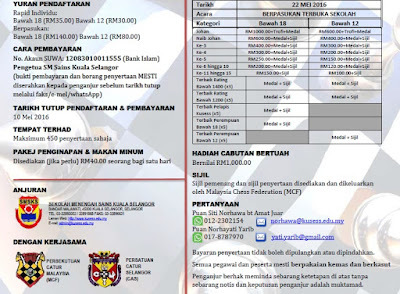 There are two categories namely Under 18 or Secondary School and Under 12 or Primary School for this event which was held on 22/5/2016 ie the second day. One hundred thirty teams took part in the former category. All the teams had to play seven rounds of 20-minute-per-player game. Below are the Final Top 15 Ranking. 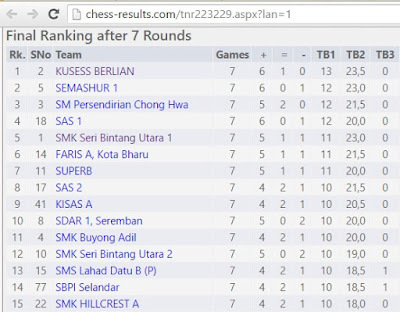 Please visit the KUSESS Chess Open blog for the photos of the winning teams. 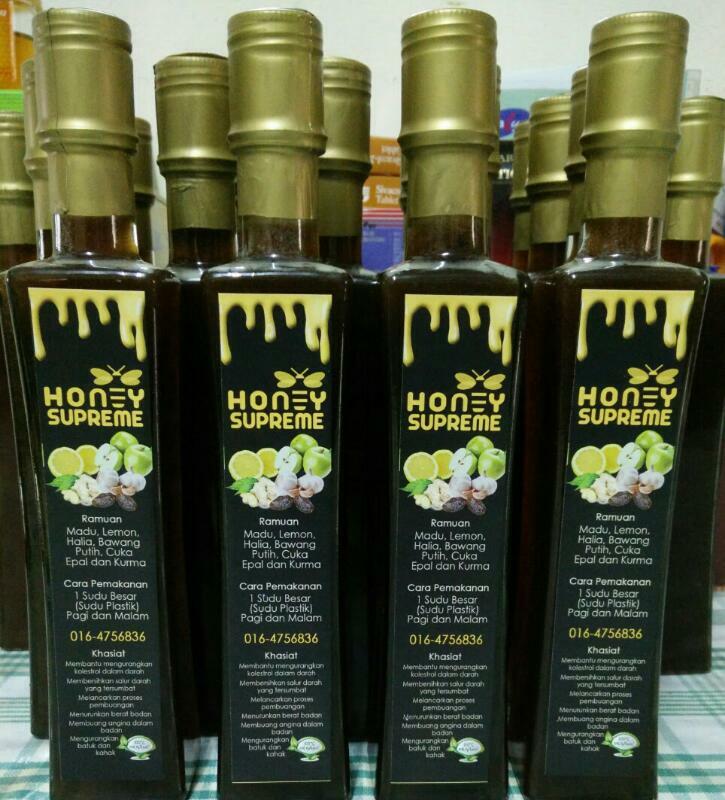 Congratulation to all the winners. 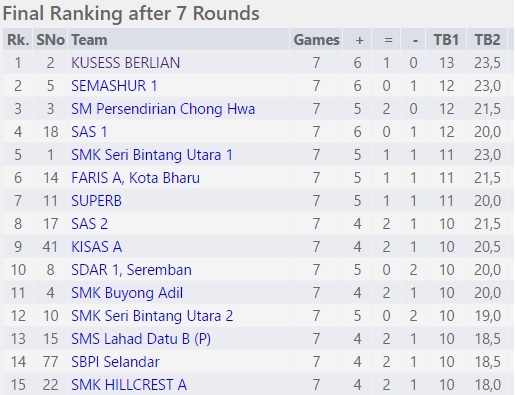 KUSESS Berlian team emerges champion again in Secondary School category of the fourth KUSESS Chess Open 2016. The team event of the championship was participated in by 132 school teams. 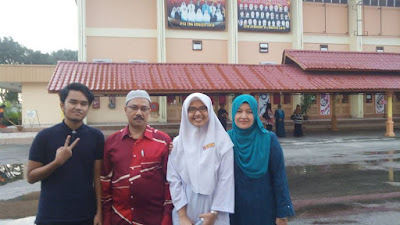 The team which comprises of Nur Najiha Azman Hisham on Board 1, Puteri Rifqah Fahada Azhar on Board 2, Muhd Ikhmal Hisham Md Ismail on Board 3 and Muhd Noor Azam Mohd Noor on Board 4. 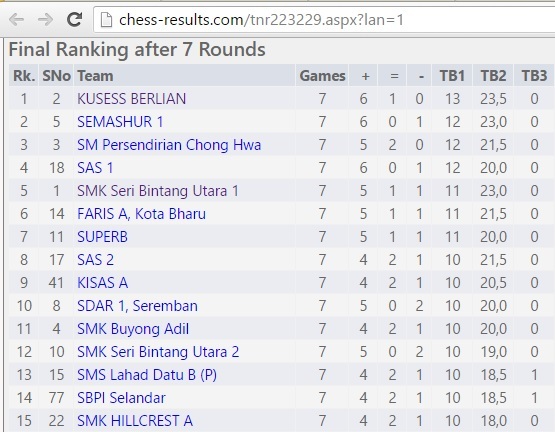 Well Done, KUSESS BERLIAN! CONGRATULATION! 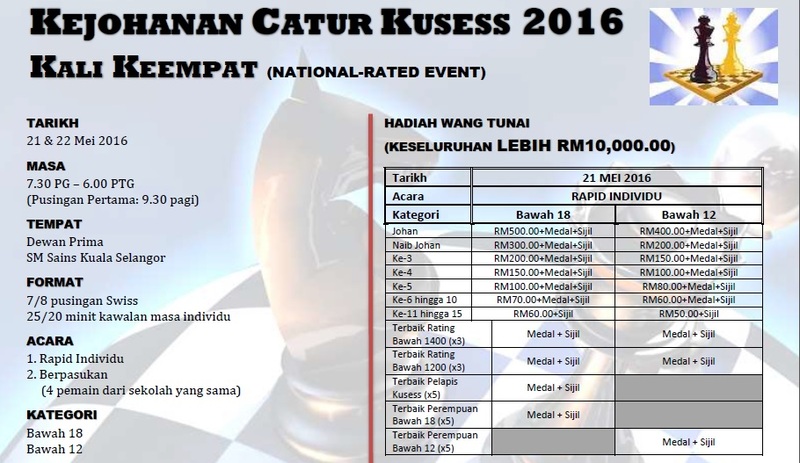 More than one hundred twenty teams have registered for the 4th Edition of KUSESS Chess Open 2016. 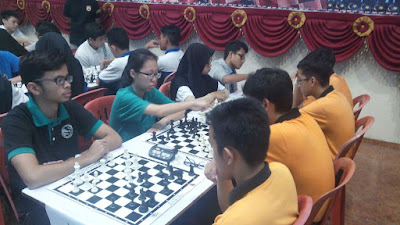 The two-day chess tournament will be held at Dewan Prima, Sekolah Menengah Sains Kuala Selangor or famously known as KUSESS. 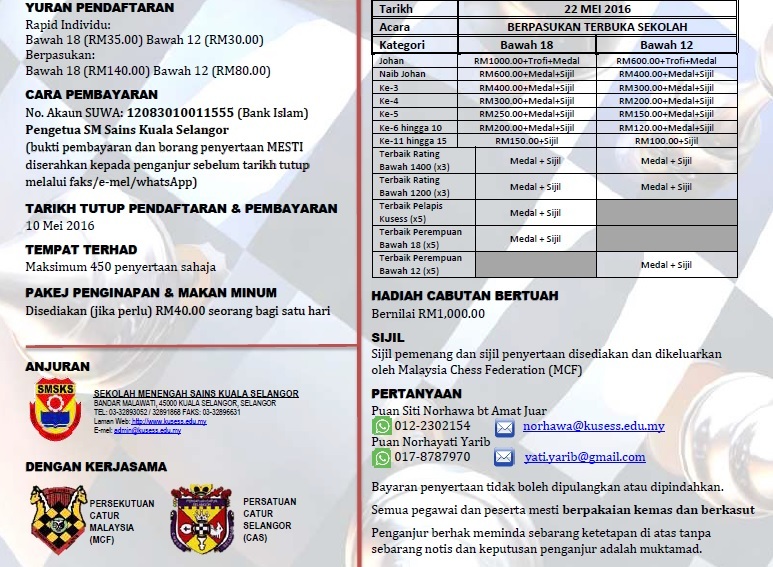 Below are the important info regarding the chess tournament. Below are two pictures of last year edition of the KUSESS Open Team Event. The defending champion for the Secondary School (U18) category, KUSESS BERLIAN, is ready to accept the challenge from other teams. Today is Saturday, 14th May 2016. It is about one week short of the 8th anniversary of this blog. 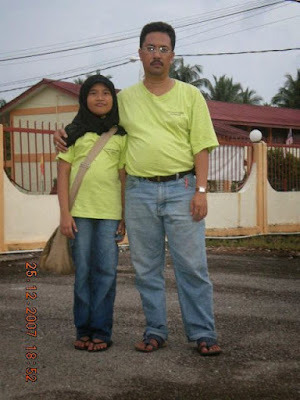 GiLoCatur created this blog in May 2008, on 22nd exactly. The first entry is not about chess but about Chelsea and Moscow. Chelsea is the EPL club that GiLoCatur likes and supports. Does GiLoCatur still like and support Chelsea. The answer is yes, but it is not the same level as used to be. What GiLoCatur likes the most about Chelsea? The first time GiLoCatur likes Chelsea is during the era of Giafranco Zola as a player. He is one of GiLoCatur's most favourite football players. He is small physically or diminutive but very skillful and lethal forward. He had won Chelsea's Player of the Year twice - 1999 and 2003. Another factor is Jose Mourinho and Didier Drogba. The former is the head coach for Chelsea twice - 2004 - 2007 and 2013 - 2015. Several championships have been won when Mourinho was Chelsea's head coach especially during his first term. While the latter is one of Chelsea's greatest players where he won the club's Player of the Year once in 2010. Regarding Moscow. Moscow is the capital city of Russia. And Chess is a national pastime in Russia since long time ago. 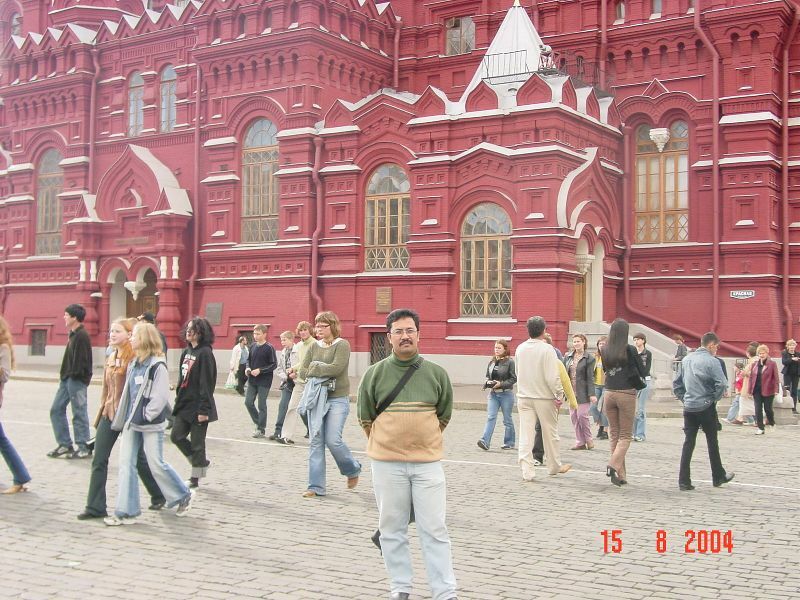 GiLoCatur had a chance of visiting Moscow more than a decade ago. Unfortunately, GiLoCatur has yet active in chess during the visit. Had GiLoCatur active in chess during then, for sure GiLoCatur would visit chess book shops and stores looking for interesting chess books and items to buy. Let's take a look at the number of entries GiLoCatur wrote for this blog. During the period of nearly eight years (22/5/2008 - 14/5/2016), the number of entries for this blog is 1,276. Obviously as in the above statistic tabular, GiLoCatur wrote the most blog entries in year 2010 with 357 entries. Obviously also, GiLoCatur is a very active blogger from year 2009 until 2011. Many factors have contributed to the less active blogging for GiLoCatur. One of them is the change of job. Hopefully, GiLoCatur will continue blogging because GiLoCatur loves writing. Today is the fifth day of May 2015 or 5.5.2016. In Mexican language it is Cinco de Mayo. It is a special day. Why? 18 years go my lovely daughter was born in Shah Alam. 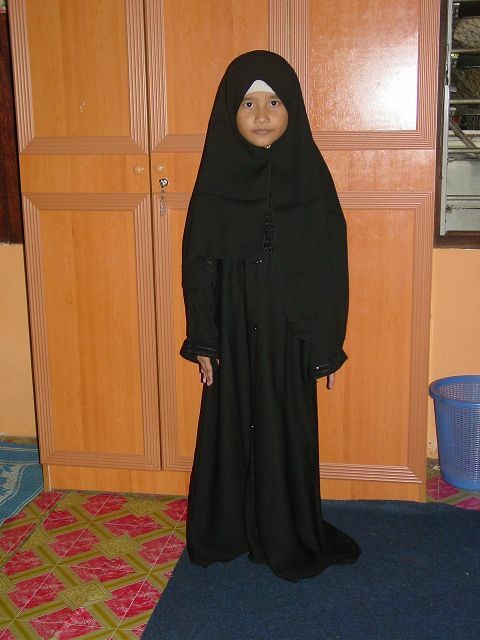 I named her ANIS FARIHA. 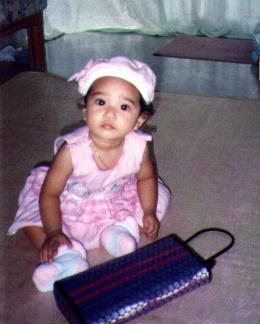 I was 30 years old back then. 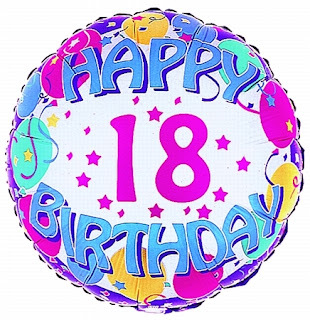 18 years has gone by so fast. Below are several pictures of Anis that capture the important moments of her 18-years life journey thus far. 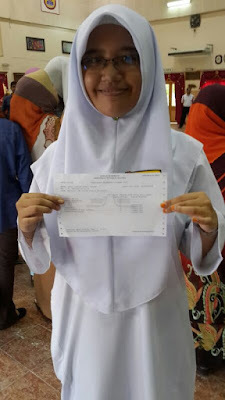 Anis was born at a hospital in Shah Alam in 1998. 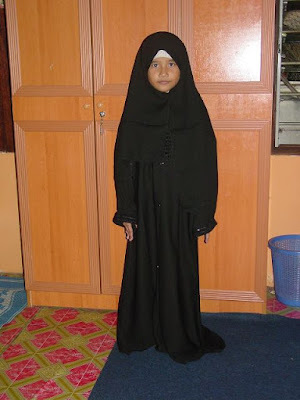 She had her early childhood living in Jaya Apartment situated in TTDI Jaya, Shah Alam. In 2004, Anis had her pre-school in TTDI Jaya. 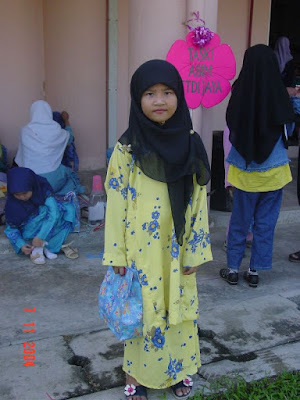 Below picture of Anis was taken during her pre-school graduation day. 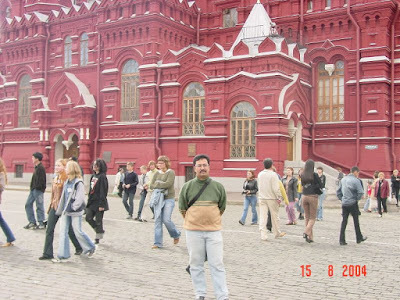 In 2005, GiLoCatur went to Jeddah for work. GiLoCatur brought wife as well to perform umrah. 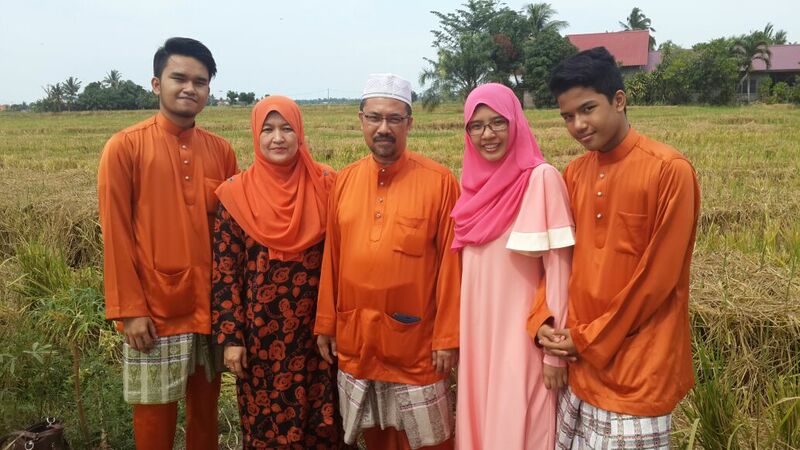 Anis and his two brothers had been staying with her grandparents at kampung during this period. Below is the picture of Anis wearing the gift bought in Kingdom of Saudi Arabia. Below picture is taken in 2007 while Anis was 9 years old. 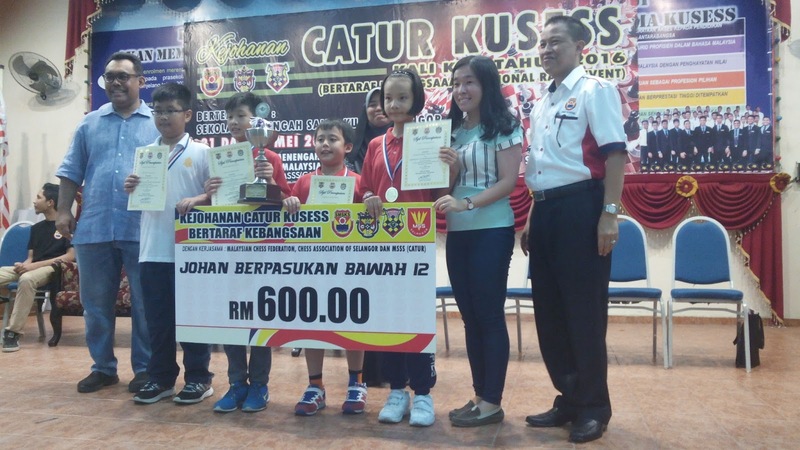 It was the first year both Fikri and Anis took part in chess tournaments. The green t-shirts are not for our chess activities. In fact, the shirts are for GiLoCatur's office family day. 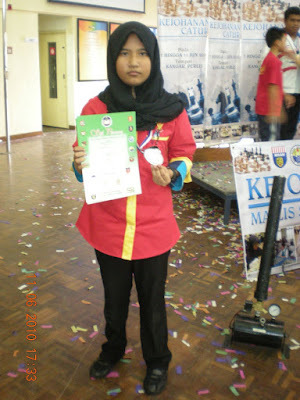 Anis had her MSSM debut in 2009. Coincidently, Selangor hosted the event in Klang. 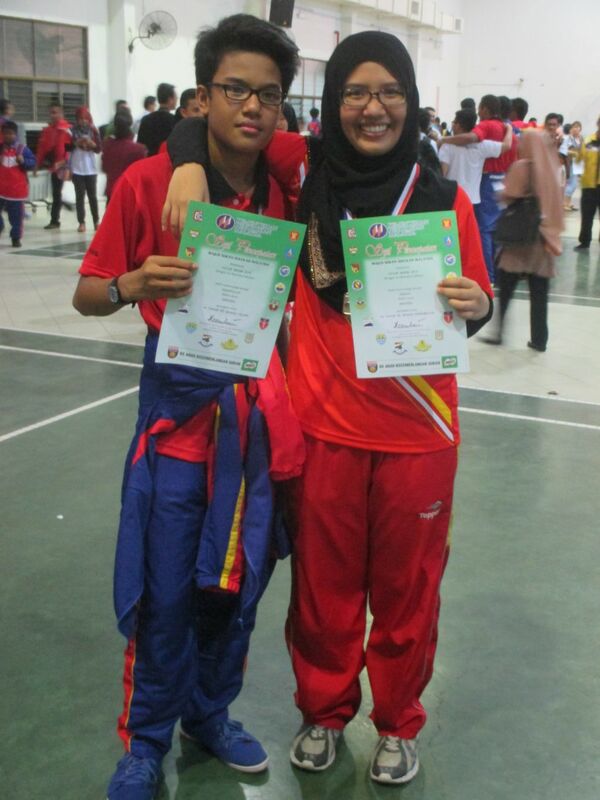 It was a golden moment for her when she won Gold in P12 Team event with three other teammates. 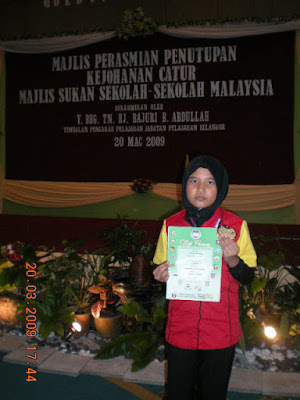 Anis had her primary school at SK Bukit Jelutong from 2005 to 2010. She was a Library Prefect at school. 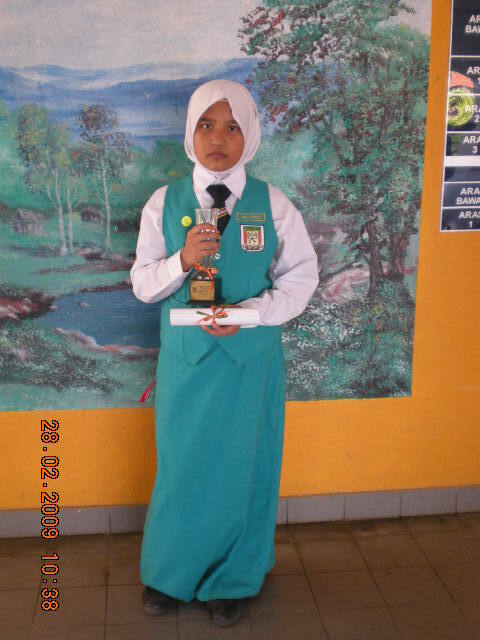 The year 2009 is very special for Anis in terms of co curricular achievements. She became champion in the MSSD chess championship for both Individual and Team events for P12 (Under 12 Girls) category. Below is the picture of Anis in MSSM Chess Championship 2010 Edition. 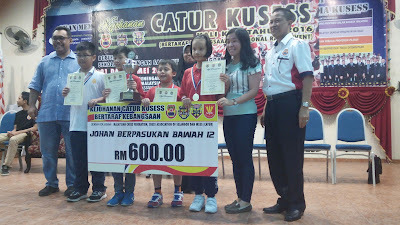 This edition is very meaningful to Anis and GiLoCatur's family because his elder brother ie Fikri managed to be in the MSS Selangor chess contingent for the first time. 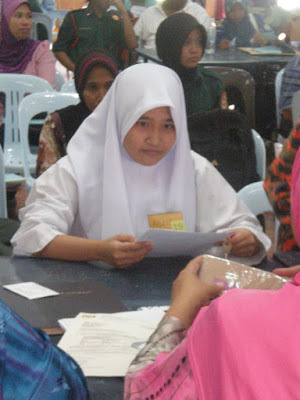 Anis had enrolled at SM Sains Kuala Selangor or better known as KUSESS in January 2011. She had studied for five years at the boarding school from 2011 to 2015. She took PMR in 2013 and SPM in 2015. The year 2015 is the final MSSS and MSSM chess championships for Anis. She had taken part in both championships for seven consecutive years from 2009 to 2015. Another interesting moment for Anis in MSSM 2015 is that she and her younger brother, Fahim, had represented different state. 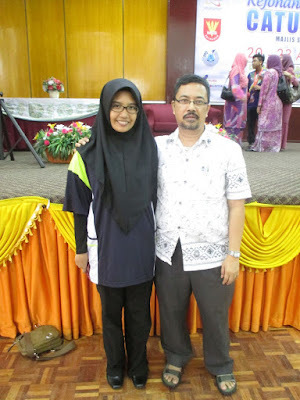 HAPPY 18 BIRTHDAY, ANIS FARIHA!